Our first All School event was on October 7th. The children put together 85 school kits which will be distributed by Lutheran World Relief. What a great feeling the children had knowing that families who can’t even afford one pencil, will have the chance to supply their child(ren) with notebooks, pens/pencils, erasers, scissors, rulers and a backpack to carry them in. Thank you to everyone who helped to sew the backpacks, or donated items for the school kits. Thank you to Charlene for organizing this wonderful service project for the Sunday School children every year and Sue Davis for her Thrivent Action Team project to provide much of the material and items which allowed us to provide more school kits than ever before. Thank you to Stacy Maloon and Steve and Carri Renn for all their help with the children in helping to put the kits together. We also kicked off Operation Christmas Child. 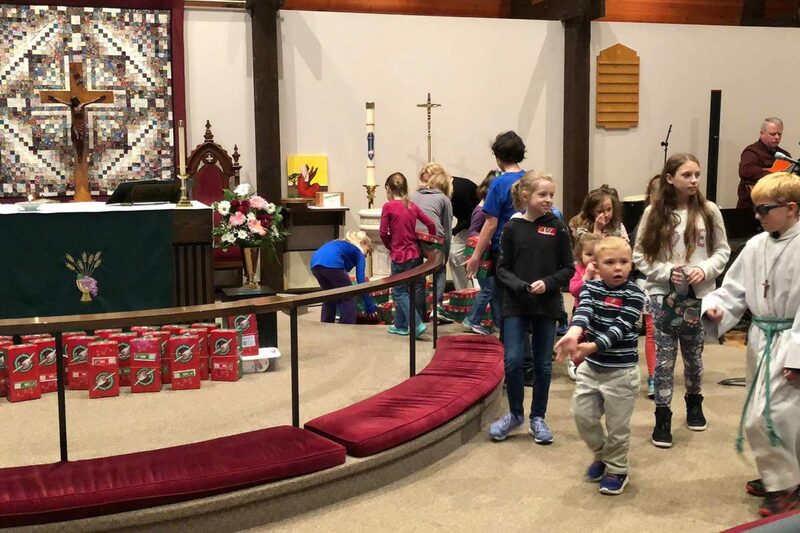 Bill and Joan Fredericksen explained to the children what joy a simple box filled with small toys, personal care items or school items, can bring to a child who might not have ever received a Christmas gift before. The children watched a short video that showed them first hand the smiles and joy that a simple shoebox brings to a child. Joan and Bill provided boxes for the children to take home, that include instructions and an All About Me page to include in their box. Thank you to Joan and Bill for organizing this very special service project. We will have another All School event on November 11th. We will be packing Operation Christmas Child boxes. Bill and Joan will be purchasing items for boxes as part of their Thrivent Community Action Team Project and the children will be helping to pack the boxes. Our Youth Service was held on Oct. 28th at the 10:30 service. What a wonderful way to share the many talents of TLC’s youth. Thank you to all the youth participants, Sunday School children and Affirmation Cabal students, and their parents for their support and encouragement. There were many compliments from the congregation! TLC is very proud of their youth.